The Radisson Hotel Cincinnati Riverfront offers 220 spacious guest rooms. Many of our rooms have beautiful views of the downtown skyline. The Radisson Cincinnati Riverfront is located only minutes from downtown Cincinnati and the Cincinnati/Northern Kentucky Airport. The hotel features an indoor pool with retractable roof, fitness room, and the 18-revolving restaurant located on the 18th floor. Unique complimentary services offered at this location not found elsewhere in the downtown/riverfront area include: parking and High-Speed Internet access. 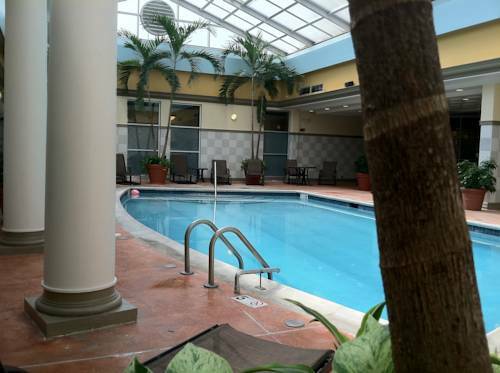 The Radisson Cincinnati Riverfront is a perfect choice for your business or leisure trip. The Fifth Lounge: Featuring buffet breakfast, lunch and pub fare. Lounge available Mon-Thurs 1130am to midnight. Closed daily from 2-4pm. BLUEGRASS BALLROOM: -10 State of the art meeting rooms, banquet facilities for up to 600 -High Speed Internet Access available complimentary. Newport AquariumNewport Aquarium showcases thousands of animals from around the world in a million gallons of fresh and salt water. Named the No. 1 aquarium in the Midwest in the Zagat Survey0s U.S. Family Travel Guide in 2004. Open 365 days a year. Xavier UniversityXavier provides a liberal arts education in the Catholic, Jesuit tradition. The University is the third-largest independent institution in Ohio, the sixth-oldest Catholic university in the nation.